For other uses, see Deck. A deck in the backyard of a suburban house. In architecture, a deck is a flat surface capable of supporting weight, similar to a floor, but typically constructed outdoors, often elevated from the ground, and usually connected to a building. The term is a generalization of decks as found on ships. Wood or timber "decking" can be used in a number of ways: as part of garden landscaping, to extend living areas of houses, and as an alternative to stone based features such as patios. Decks are made from treated lumber, composite lumber, composite material, and Aluminum. Lumber may be Western red cedar, teak, mahogany, ipê and other hardwoods. Recycled planks may be high-density polyethylene (HDPE), polystyrene (PS) and PET plastic as well as mixed plastics and wood fiber (often called "composite" lumber). Artificial decking products are often called "wood-plastic composites". These days, WPC's have more widely known by different brands like Trex, Azek, Ecornboard etc. Historically, the softwoods used for decking were logged from old growth forests. These include Atlantic white cedar, redwood and Western red cedar (redcedar). Atlantic City built the first coastal boardwalk in the United States, originally constructed of Atlantic white cedar. However, it was not long before the commercial logging of this tree and clearing of cedar swamps in New Jersey caused a decline in the availability of decking. Atlantic City and New York City both switched to Western red cedar. By the 1960s, Western red cedar from the US was declining due to over-logging. More expensive Western red cedar was available from western Canada (British Columbia) but by then, pressure treated pine had become available. But even with chemical treatments (such as chromated copper arsenate or CCA), pine decking is not as durable as cedars in an outdoor environment. Thus, many municipalities and homeowners are turning to hardwoods. Decks are often built from pressure treated wood. Pressure treated wood is long lasting and holds up to wet and icey weather conditions. Pressure treated wood however is treated with chemicals which have been known to be toxic. It is also important to note that both softwood and hardwood decks will need to be finished after installation using either an oil or varnish to prevent weathering, wear, mould, algae and wood boring insects. Generally, hardwoods used for decking come from tropical forests. Much of the logging taking place to produce these woods, especially teak, mahogany and ipê, is occurring illegally, as outlined in numerous reports by environmental organizations such as Greenpeace, Friends of the Earth and Rainforest Relief. US tropical wood imports are rising, partly due to the demand for decking. Due to environmental and durability concerns, composite decking (a mixture of two materials, typically wood pulp and recycled material such as plastic bottles or plastic bags) have appeared on the market. Proponents of composite decking have touted this as a much needed development as this helps to curb logging of trees for new decks. However composite decking has been found to contain harmful chemicals, cannot be refurbished, and despite claims from decking companies, some composite decking still attracts mold. However newer more modern composites feature a cap or shell that prevents mold and staining. Residential decks may contain spaces for cooking, dining and seating. Cooking areas ideally should be situated near the patio door while out of the way from general foot traffic. Dining spaces will include patio tables. For a typical 6 person outdoor patio table building an area of 12' x 16' (4x5 m) is ideal. If deck space is available, homeowners may choose to include a seating area for outdoor couches and benches. The deck of a house is generally a wooden platform built above the ground and connected to the main building. It is generally enclosed by a railing for safety. Access may be from the house through doors and from the ground via a stairway. Residential decks can be constructed over steep areas or rough ground that is otherwise unusable. 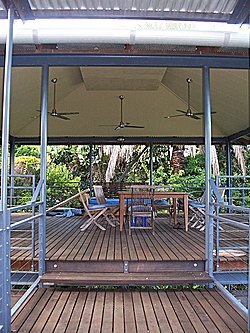 Decks can also be covered by a canopy or pergola to control sunlight. Deck designs can be found in numerous books, do-it-yourself magazines and web sites, and from the USDA. Typical construction is either of a post and beam architecture, or a cantilever construction. The post and beam construction relies on posts anchored to piers in the ground. Typically these types of structural decks are engineered and require an experienced construction company that specializes in structural decks. Cantilever decks rely on floor joists that protrude out further than the wall of the house. While this type of construction is common, it raises significant safety issues if the decks are not properly waterproofed and flashed. There have been a growing number deck failures resulting in death and critical injuries. Another key component of decks are code compliant railings. Railings on decks above 30 inches are considered guard rails. Guard rails have a specific building code requirement for both height and structural strength. Most U.S. commercial building codes require a 42-inch guardrail on decks, and 36 or 42 inches for residential code depending on the state. Typical railing assemblies must meet structural strength requirements of 200lbs of load force per foot. 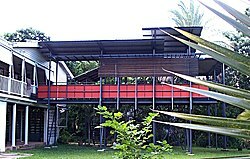 In short, decks are complex load bearing structures that most often require structural engineering, plans, and permits. Larger buildings may also have decks on the upper floors of the building which can be open to the public as observation decks or greeneries. A deck is also the surface used to construct a boardwalk over sand on barrier islands. Laying deck or throwing deck refers to the act of placing and bolting down cold-formed steel beneath roofing and concrete floors. This is usually done by an ironworker, sometimes in conjunction with a cement mason or carpenter. It regarded as one of the most physically demanding jobs in the iron working industry. In the UK the various ban on smoking in public buildings was expected lead to an increase in the use of timber decking for outdoor spaces where smokers can gather. In multi-story commercial construction, the dominant form of deck (including roof deck) construction is composite steel deck. High-rise commercial and residential buildings with rooftop decks often utilize urban landscaping techniques to create "green spaces" or "sky parks". With this trend in outdoor living increasing, many landscape architecture firms are specialized in the design, construction and maintenance of these spaces. Wikimedia Commons has media related to Decks (architecture). ^ "Lumber Pressure Treated with Chromated Copper Arsenate". New York State Department of Environmental Conservation. 2013. ^ "Choosing The Best Decking Oil". Blueprint Joinery. Retrieved 2019-02-08. ^ Paster, Pablo (2009). "Deck: Wood or Plastic?". Treehugger. ^ L.O. Anderson, T.B. Heebink, and A.E. Oviatt. (1972). "Construction guides for exposed wood decks. Agriculture handbook no. 432". Washington: USDA, Forest Service.